What is life like for people who travel for business? If you live in Baltimore, then there’s a one in three chance that you occasionally board a plane or train to travel long distances for work. Thirty-four percent (34%) of Baltimore workers travel for business. So, what’s it like to fly to a far-off place just for work? What do you think of when you imagine the lifestyle of someone who travels for business? If you were a business traveler, perhaps you’d spend one week in China, the next in Peru, then a month doing business dealings in London! While that thought is exciting, most Baltimore residents who travel for work don’t actually fly to more than one or two countries per year. In fact, only four percent (4%) of people living in Baltimore travel by plane more than ten times per year. For the average business person in Baltimore, living in the clouds is a thing of the past, with only nine percent (9%) of business travelers reporting that they fly more than ten times a year. However, most people who travel for business don’t have to worry about scheduling their flights alone. 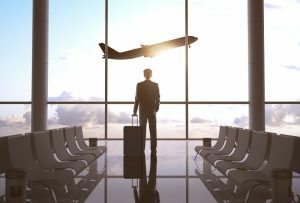 Out of the thirty-four percent (34%) of Baltimore residents who travel for business, slightly more than half handle (53%) their own travel arrangements while forty-three percent (43%) utilize corporate tools such as the corporate travel department, company travel portal, or executive assistants/administrative personnel. Traveling for business is far from glamorous. The savvy business traveler packs their shampoos and other hygiene products in the correct volumes, avoids packing excess items in their luggage, and utilizes amenities provided by hotels and airports. When it comes to this last point, public wifi is a great amenity to take advantage of. Ninety-three percent (93%) of Baltimore travelers have utilized public wifi while traveling for business. Of the seven percent (7%) of people who do not take advantage of public wifi, sixty percent (60%) cite security concerns, while twenty percent (20%) say that they use their own personal wifi hotspots. It’s safe to say that the vast majority of people who travel for business will be utilizing wifi–whether it’s the airport’s or their own–to work while they travel. This entry was posted on Thursday, February 2nd, 2017 at 1:17 pm. Both comments and pings are currently closed.